CAMPANIA Traveling in Italy can be a passage back in time. Campania and Terra Felix, the happy land, are rich with antiquities and evidence of the past. Seeing something, and then hearing the associated story, is an immersive experience. On my last trip I saw and learned about wondrous places with hidden frescoes, mosaics in the field, two thousand year old amphorae, and centuries old grape vines. I would not have found them on my own. On a hike up Monte Massico, Nicola described a hidden treasure we were about to see. Past the stone foundations of ancient homes is the Cave of Saint Martin. Martin was a hermit monk of great holiness and divine favor. He lived during the sixth century, retreating to this self-imposed exile for 40 years, isolated and dependent on faithful followers to bring him food. The partially obscured cave is near the summit and holds stunning, delicately faded frescoes that date back to this period, or perhaps even earlier. The artist is not known and the murals are in disrepair, but the overall impact is one of profound mystery. We sat high on the mountain, taking in breathtaking views of the surrounding valleys, drinking Nicola’s Aglianico, eating cheese, salumi, and crusted bread, and pondering Martin’s dedication to the contemplative life. Nicola recounted that for centuries this mountain has been a source of refuge and sustenance because of its green and fertile slopes. He described legends, long forgotten, of elves, mysterious grottoes, and sacred plants. One legend states that little elves worked in secret to make the land fertile, aerating the soil, and as a result, making the wine better to drink. Another speaks of the town of Nocelleto, near Carinola, where stands a lone majestic tree, la quercia del beneventano. It is an imposing spectacle of nature that experts think is actually three intertwined trees. The visual effect is that of three persons embracing and with great perseverance they are defending a secret. Older persons in the area remember being told that great treasures lay within the tree, but no one has ever found them. According to this story, these treasures were the spoils of a great pillage at the expense of a convoy along Via Appia. It was also believed that a curse would befall those who tried to take the treasure, because the souls of the robbers lived in the tree. Via Appia was built in 312 B.C. and is considered the world’s first modern highway. Originating in Rome, it travels south down the coast to Capua, then southeast to the Adriatic Sea and the port city of Brindisi in Puglia. 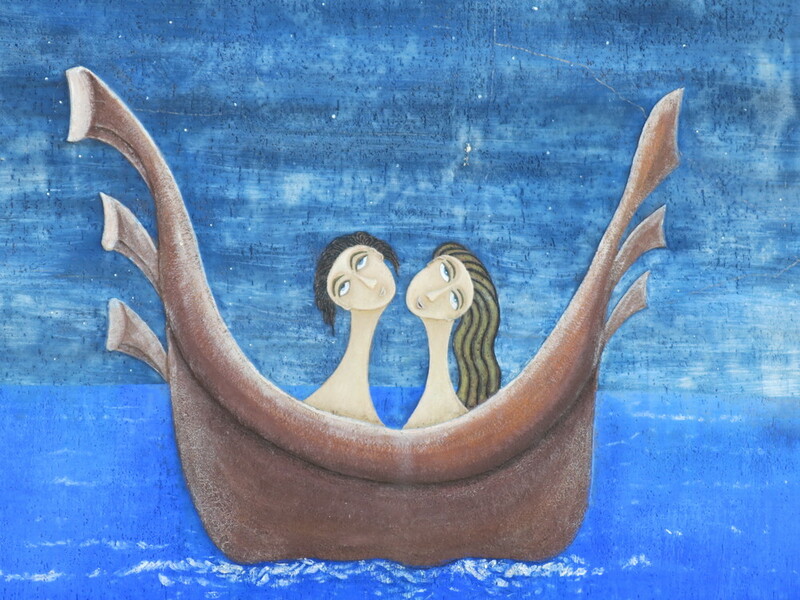 From Brindisi, Roman ships sailed to Greece and Egypt. Campania and Rome are linked through this ancient tale, thus hinting at the history of trade and travel between these regions. Hearing these stories, and being in the same spots that the stories originate from, is a reminder of how much life has changed. Some practices no longer exist, and if they do, they are only in small, fairly unknown amounts. For example, the ancient Romans used to plant rosemary, apples, figs, and plums both upstream and downstream of their vineyards, with the thought that the grapes would absorb their scents. Nicola recalled that the Roman tradition was to produce three types of Falerno: a fresh wine/juice to be produced and consumed in a few days, a wine to be consumed within a few years (givinum tenuous), and an even bigger Falerno prepared for a long life, maybe 100 years (givinum austerum). In accordance with his wish to combine his knowledge of ancient traditions with modern techniques, Nicola has also planted rows of rosemary around some of his vineyards. Ask anyone in Naples who has worked with flour over the years—they know how the nature of the grain has changed. Master Pizzaiuolo Adolfo Marletta of the pizzeria La Spaghetatta in Vomero described how his father, a pizzaiuolo in the 1960’s, could take collapsed dough and re-form dough balls the next day because there was less gluten in the flour; overall this dough was more pliable and easier to extend by hand. In Mondragone, along the Tyrrhenian Sea and the Appian Way, there is an open field containing a ruin, with a small section of mosaic flooring. To get to it there is a rough road, which passes some overgrown and untended Roman aqueducts that are almost hidden from view. We then walked through a fence into a nondescript field where this fragment of a mosaic floor remains. 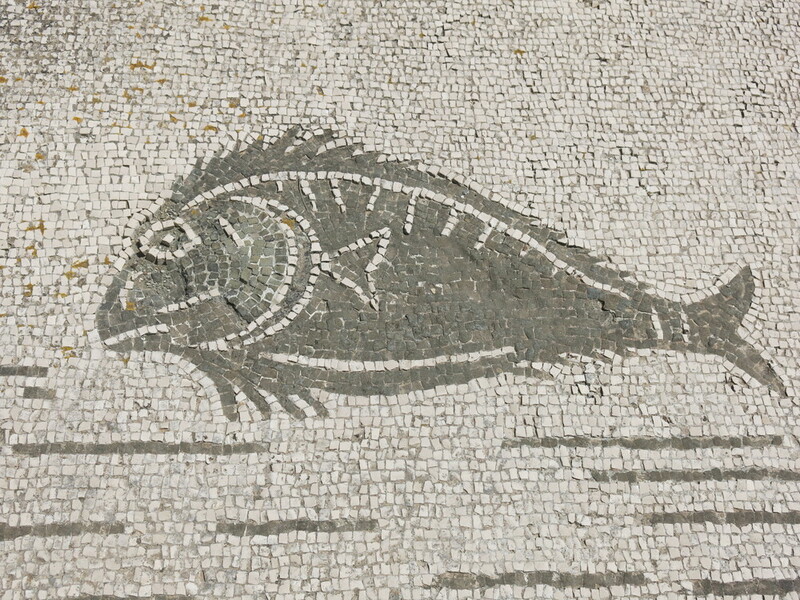 The small black and white stone squares illustrate fish and a horse like creature. The villa that housed the mosaic was called Villa San Limata, and dates back to the first century. It belonged to a wealthy Roman merchant and contained a system of thermal waters. It had direct access to the sea, as the sea came into the house through a tunnel. The villa was transformed into a cultural baptistery three to four hundred years after Christ, and then disappeared completely around the fifth century. Mosaics proliferated as an art form across the Roman Empire, from Antioch to Africa. Different styles included marble, tile, clay, glass paste (smalto), stone, and shells. They were popular and plentiful in private homes and public venues. These small, black, white, and colored squares depicted fish, animals, flora, objects, myths, people, and events of everyday life. Those that remain are an invaluable record of daily activity, clothing, agriculture, hunting, means of cooking, sport, love, and warfare, and give us clues as to what mattered to the people. Our mosaic interpretation of a fresco of Flora, who was the Roman goddess of spring, at Spacca, is homage to this epic art form. It is also an example of our commitment to the tradition of storytelling and collaborations—in this case, between Domenico Mazzella, Ginny Sykes and Julia Sowles-Barlow, all of whom have deep ties and a love of the arts and culture of Italy and who together brought this contemporary vision to life. Southeast of Monte Massico lies Benevento and the nearby National Park of Matese. This ancient land was first inhabited by the Samnites and later colonized by the Romans. 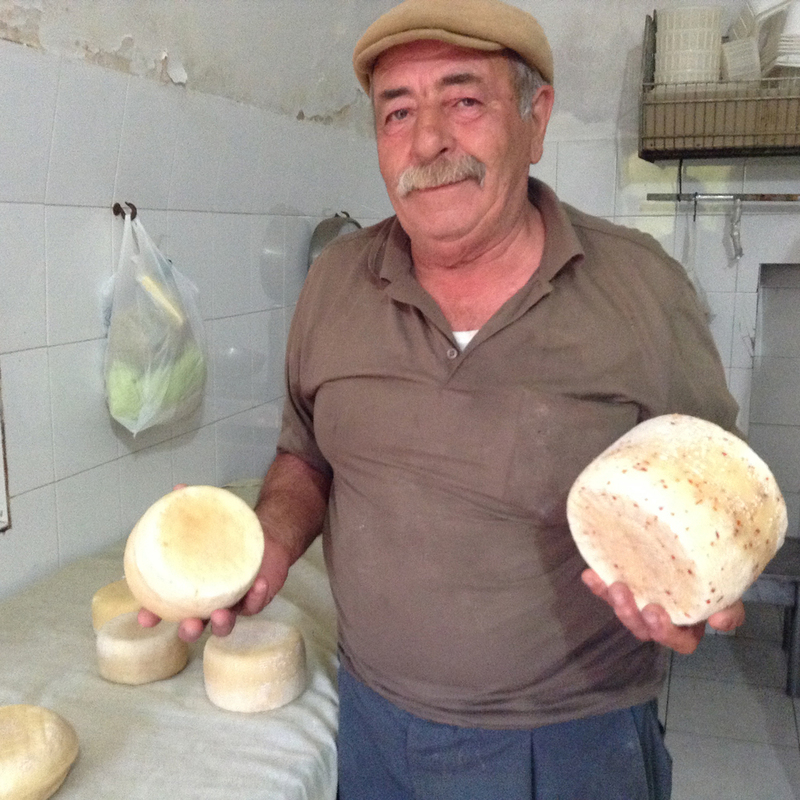 My interest in Matese was finding artisanal Pecorino. I first tasted sheep’s milk cheese from this area while working with Franco Pepe in nearby Caiazzo. The sheep graze in pristine pastures at high elevations. The flavor profile of their milk changes with the seasons. Flowers and grasses vary over the year, and as a result, so will the flavor of the cheese. Antonio Sangiovanni of Agriturismo Sangiovanni was our guide into the mountains and to a farm we would have not found without him. In a remote spot, past mountain lakes, streams, and open fields, we arrived at a solitary family farm containing 700 sheep. I was excited, as for years I had seen the mountains of this park from afar. I knew of the farmers, their strong embrace of artisanal ways, their folk beliefs, and cultural traditions. Although we arrived unannounced, the family quickly warmed up to us as we expressed sincere interest in their work and respect for the practices they continue to follow generation after generation. I selected a variety of pecorino cheeses, some picante, some milder, which I brought back to the Lombardi family so we could enjoy them together. The Lombardi’s are the proud producers of a particular pecorino, Conciato Romano, which is made in the same manner, as did the Romans two thousand years ago. It is in great part the time I have spent with the Lombardi family at their agriturismo, Le Campestre in Castel di Sasso, over many years now, that has nourished my appreciation and respect for this rural way of life. A natural reflexology pool was a highlight. Cold water alternates with warm, and one slowly walks across the stones at least ten times in a circular fashion. This action is said to provide serious and lasting health benefits. The more times you walk, the more benefits you will receive. It is a walking meditation brilliantly conceived from nature. The entire location is simple, unadorned, and the feeling was magical. The wine Biancolella, and rabbit, the culinary symbol of the island, were also the focus of our time there, visiting the Mazzella vineyard (no relation to Domenico, or as they joked, perhaps there is) and having lengthy discussions. Our guide was the vigorous and extroverted Antonio Mazzella, who at close to seventy years works the land and nurtures his rabbits high above the waters. Antonio works with his son Nicola, the third generation of winemakers. The Biancolella grapes grow in a perfectly balanced eco-climate of sea, salt, sun, and air, infused with the scents and tastes of the herbs, flowers, and grasses that grow right alongside the vines in the same volcanic soil type as the thermal baths. Wine has been made on the island since the eighth century B.C., when Greek colonists chose Ischia as their far western outpost in the Mediterranean and brought their system of terracing, training, and pruning grapevines. These methods are still used today. The soft white Biancolella is famous for its minerality and flavor that comes from this particular volcanic soil and sea-salt air. It pairs wonderfully with Coniglio all’Ischitana. According to Carlo Petrini, founder of the Slow Food movement, “it [rabbit] represents peasant wisdom: nothing is wasted. In fact, the rabbits eat a diet prescribed by the ancients – fruit, tree trimmings, fig leaves, vine shoots and tasty greens.” This Ischian rabbit dish has been a typical dish for centuries due to the abundance of wild rabbits on the island. Though most farmers today breed rabbits in cages, the ancient and traditional way to breed rabbits was to let them run free in narrow tunnels three to four meters long underneath the ground. Antonio prefers the cages, so he can separate out the male rabbits and control the number of litters. Less offspring for the mother rabbit allows greater quantities of milk to be shared. Antonio was a masterful storyteller; painting a vivid picture of his acquisition of the land and the many years he has worked it. The vineyards, high in elevation, seem as if they are falling into the sea. As we enjoyed stunning vistas, Antonio shared his thoughts on raising rabbit as well as the evolution of his family’s wine production over many years. The path to the vineyard is reached from high above, and is cut through the soft volcanic soil. The descent to the vineyards is quite steep and one must descend these caverns without slipping on the dry ground. At times, the use of a rope embedded into the rock is necessary to secure your footing. The grapes are hauled up for production upwards of twenty trips during the harvest—a robust and exhausting task. It takes a deep love for the land and respect for the craft in order to thrive and endure such taxing conditions. The proof is in this special wine. We are proud to have introduced Cantine Mazzella wine to America. Amphorae, used for the storage of wine, oil, and other prized liquids, date back eight thousand years. Originally made of earthenware and coated with beeswax, they were buried in the ground to ensure proper atmospheric conditions. With the expansion of the Roman Empire, the form of the amphora took precedence over its beauty. They were no longer decorated in the manner of the Egyptians and earlier civilizations. Ease of transport while preserving the integrity of the content was more valued. To my eye, urns are beautiful without embellishment. Winemaker Vincenzo Ambrosio of Villa Dora, located in the Parco Nazionale of Vesuvio, discussed the history and purpose of a two thousand year old amphora, (urn) still in perfect condition, that was found on their property, his farm. This vessel, called a Dolia, was an important archeological find and that the Romans used it to ferment the wine. Scientific analysis of fragments inside the amphora confirmed that the Romans drank Piedirosso. This was a local wine dating back to the eruption that buried the people of Pompeii. As it was 2000 years ago, the same wine in the same location continues to be made today. Smiling as he sniffed at the mouth of the amphora, Domenico commented that he “could still smell the Romans.” Vincenzo also affirmed that oil and wine cultivation used to go hand in hand. There are a few wine makers who still follow this practice, but today most production of oil and wine are separate. Wines from Tenuta San Francesco, in Tramonti, located about an hour from the Amalfi coast on a magnificent stretch of interior land, have their own special story. For example, while the Tintore di Tramonti is especially cared for by winemaker Gaetano Bove, the star attraction is the 500 year-old mother grape vine that has been in continuous production. It is said to exist because of “the gesture of a woman.” The women cut the grass, and they were careful not to disturb even the smallest emerging vines from the ground. Whether myth, legend or fact, this simple phrase illustrates the deep relationship between land, people, and their culture. The seeds were planted at a specific time of the year, under a certain moon, and in rhythm with the felt nature of both planter and land. This is an ancient biodynamic precedent. To see this vine in person is enough to make one weep, existing as a marvel that is hard to describe. Its branches extend hundreds of feet in each direction, and its twists and turns over the centuries have been lovingly tended and supported with a variety of stakes and trellises. Gaetano is bronzed, calm and clear-eyed, gazing as he speaks as if he sees a truth far out toward the horizon. He, like the other makers we encountered on this journey, carry on practices that are what we all love about Italy. Person by person, with hard labor, and a profound love for the lands they know so well, we are fortunate to have them as caretakers and proponents of a valuable legacy. In Furore, we viewed another cultural and ongoing legacy: that of “the town that does not exist.” Furore is known as such because there is no central piazza or concentration of homes, and no telltale sign along the coast that there is a village high above. Its local governance has overseen the creation of murals on the exterior walls of the town by artists from Italy and all over the world since 1980, spearheaded by Sindaco Raffaelo Ferraioli. These brightly colored murals celebrate the traditions and interpret the history of the area. Furore is a quiet hidden gem high above and between Amalfi and Positano. It is also known as the place where the sea meets the sky. From the balcony of the Hotel Bacco where we enjoyed the astonishing cooking and care from the Ferraioli family, we gazed for hours upon the smooth transition of blues that is seamless and soothing. Furore is also known for exquisite rural hiking trails within a five-minute walk down the road, including a hike we did, called “The Path of the Gods.” For us, it meant a slow and enjoyable four-hour trek from Furore to Agerola, Agerola to Positano, where the final descent is 1000 stone steps to sea level. The terrain shifts from gentle hills, terraced vineyards and gorgeous natural rock formations, to challenging rocky ascents and interior cool woods where the birds are in charge. The path then dramatically opens out to sweeping views of the waters where you can even see Nureyev’s tiny island. One is constantly meandering in and out of sight of the water. The high intensity rock climbs, with dwellings carved as if by hand into the sides of steep inclines that are swept by the winds of centuries, remind us that these romantic vistas were also born out of the necessity of creating routes of transport and sheltering outposts along the way. The Path of the Gods was a climactic experience. The walking and alternating views of horizon and interior provided time to step back and consider the profound sweep of history we had experienced, all within a small region that is both humbling and deeply inspiring to know about. Photos/videos credited to Jonathan Goldsmith except where noted. While harder to imagine as winter settles in, nevertheless I have fond memories of my spring 2014 visit to Napoli. Wild flowers were blooming, grasses were brilliantly varied shades of green and asparagus were waiting to be picked. Once more I settled with ease at the Agriturismo Le Campestre (Castel di Sasso), as one returning to a home away from home. With Domenico Mazzella, my usual traveling partner there, we hit the town of Tufo, 30 miles east of Naples, to meet with Ferrante di Somma di Circello of the Cantine di Marzo. The cantina dates back ten generations to the year 1647. As the plague devastated Naples, Ferrante’s ancestor, Scipione di Marzo, fled his hometown of San Paolo Bel Sito, located near the town of Nola, arriving in Tufo. He later built his winery here, which is one of the oldest in Italy. Scipione took with him some of the local white varietal vines, at the time called both Greco del Vesuvio and Greco di Somma. Ferrante refers to commonly known genetic studies that link this grape to Asprino di Aversa, a wine we have begun label approval for having in house shortly. Succeeding generations of the family made major land acquisitions in the area. These increased land holdings led to the discovery of sulfur and brimstone. In 1866, while riding his horse on his estate, Francesco di Marzo noticed shepherds on his property burning rocks to keep warm. While examining the rocks, he understood they were burning the brimstone they found on the land. With this discovery, the family began a large mining operation of the natural brimstone, known as the gold of tufo. Rich in nutrients, it was valuable to agriculture as a soil- enhancing agent. Greco di Tufo, with its minerality, complexity and aromatics, ages well and has less fruit than many of the other local white wines. Its unique characteristics derive from the sulfur and tufo rich soils. Millions of years ago a shallow tropical sea covered the area. Deposits of shells and organic matter created diversified geologic strata, and the resulting abundance of brimstone, sulfur and chalk. The roots of the planted vines act as a sponge with the brimstone and sulfur, contributing to the aromatic signatures of the grape. The terroir of the region helps distinguish this Greco di Tufo from Greco wines of surrounding areas. Ferrante, along with his father and sister, are engaged in an ambitious program to bring their Greco di Tufo production to a level that reflects their four hundred years of tradition. Having studied wine making in Burgundy, Ferrante is adept with all technical aspects of their operation. He has a great understanding of the traditional French method of Dom Perignon and is very proud of the sparkling Greco he produces. In fact, in the 1800’s, with the initial onset of the devastating plant disease phylloxera in France, the French had to look to the Italians for the production of a sparkler similar to their beloved Champagne for importation. Although I could have listened to Ferrante for many more hours, we had additional wine makers to visit. Bruno DeConciliis, someone very dear to our hearts, lives near Paestum in the Cilento. Last year we introduced two of his wines, a white spumante and a red that Bruno personally made for our pizzeria. Bringing his wines to Spacca is a wonderful collaboration, and an important part of our mission to celebrate art, innovation, spirituality and friendship. I treasure these words. They reflect my experience over the years with many of the artisans we work with, be it producers of wine, cheese, tomatoes, fruit, salumi, olive oil, vinegar, pasta, and pizze. There is a story behind each product that we share with those coming to the pizzeria. It is as close as we can get to the artisans themselves with us at the table. Other wineries we visited over the course of the year included Cantina Mazzella in Ischia for Biancolella , Masseria Campito in Gricignano di Aversa for the elusive Asprinio di Aversa, and Tenuta San Francesco in Tramonti along the Amalfi Coast. San Francesco is nestled into the Lattari hills beyond the coast. The Tramonti area, with its many villages, and their vineyards and churches, is an unexpected treasure. It is a place where time seems to have come to a stop. Along with Aglianico, Piedirosso Falanghina, and Biancolella, Tenuta San Francesco produces both white and red blends, , incorporating rare varietals such as Pepella, Ginestra, and Tintore. We will present these wines after their arrival in early 2015. As we broaden and deepen our inclusion of Campanian wines, we will have more zones and varietals represented. I am indebted to Domenico Mazzella, and could not have done this work without him. Just down the coast past Vietri Sul Mare is the small fishing village of Cetara. One does not go there for its beaches, but for its Colatura; an amber colored anchovy extract. Similar to the Ancient Roman garum, it is rich and aromatic and is used to flavor foods of almost every kind, like salt might. It is considered a unique product of gastronomic excellence. We visited with Giulio Giordano at his shop Nettuno to learn firsthand the process of preparing the anchovies for salting, packing them in terzigno wood barrels, and the eventual extraction of the “liquid gold.” It is a tradition passed down generation by generation. Pizza fritta (fried pizza) is a popular, centuries old choice among many in Naples that has crossed over to America in recent years. I trust that five years ago, few here knew of “the montanara” or of Forcella, a quartiere (neighborhood) in Naples. 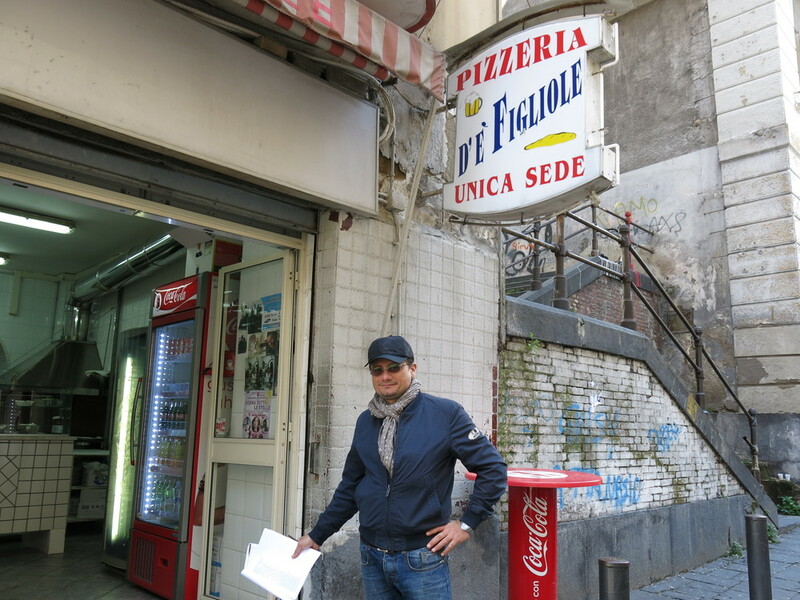 O Pagnottiello and D’e Figliole were two friggitorias that Domenico wanted me to try; they are the first two stops on the pizza tour he offers through his Discovers Naples organization. Both locations were loud with the hustle and bustle of the street, and locals waiting on the sidewalk for the quick and flavorful take-away it is meant to be. They sure are tasty. There was a new pizzeria to visit. Hache is in the chic Chiaia area along the lungomare. Though some may say, as does the owner Fabio Amibile, that their “gourmet” pie is a step removed from a “vera pizza”, it is as soft, fragrant, and digestible (the holy trinity) as many I have sampled. It reminded me of the pizze put out by Franco Pepe. Both use the highest quality ingredients typical of Campania, and great attention is paid to the dough. The cornicione, the pie’s border, was light and airy. The dough also reminded me of the impasto of the Salvo brothers, Pellone and Di Napoli in Fuorigrotta Fabio’s use of Piennolo tomatoes and capers on the marinara was delicious and eye-catching. Though many have been making use of these tomatoes and other varietals over the years, I had not paid as much attention to the tomato in its own right beyond the San Marzano. 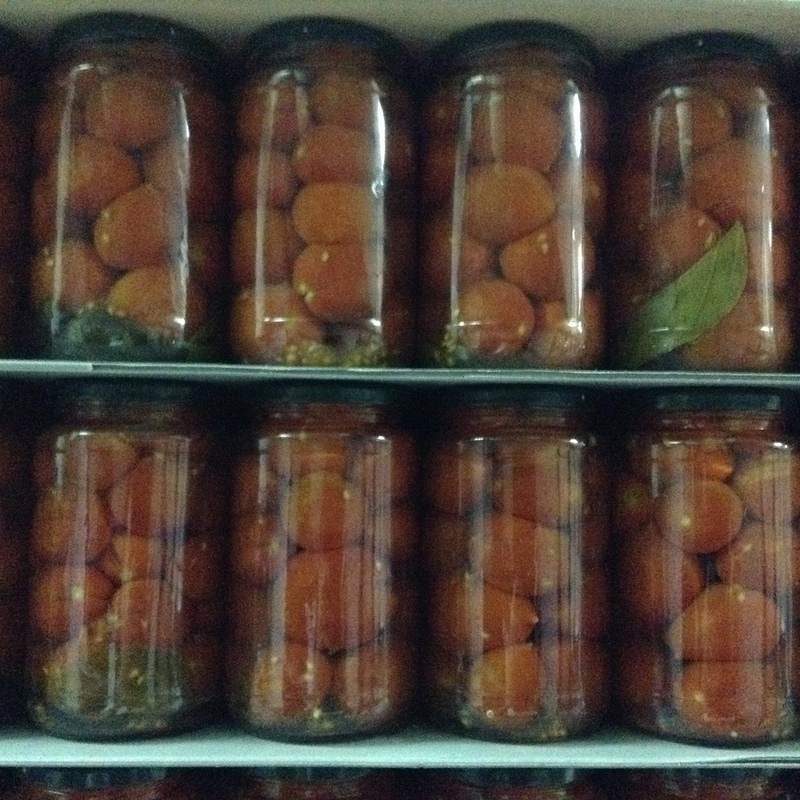 Long story short, our storage area at Spacca is now filled to the brim with tomatoes of all types; San Marzano, Piennolo red and yellow, Gragnano and Corbarino. Though these tomatoes are all from Campania and from small producers, their profiles vary with each microclimate, soil composition, and method of production. Over the years I have worked with many well-respected pizzaiuoli in Naples, such as Antonio Starita, Enzo Coccia, Adolfo Marletta, others at Di Matteo and Da Michele, and Roberto Caporuscio in America. In more recent years, I have followed the work of Franco Pepe in Caiazzo. His method of making impasto by hand, as was done by his father and grandfather, is unique. The way he works the dough by hand, diving in with open fingers, allows more air to circulate in the dough, thus more lightness and gentleness to the dough. The open hand also allows an immediate tactile sense of the mix. It takes patience and time and utter devotion to make such quantities by hand each day—upwards of 600 pagnoti on a busy weekend night. Franco is considered one of the greatest pizza makers in the world. I have also devoted much energy to understanding how pizza verace (classic Neapolitan pizza) differs from pizza rustica and other artisanal styles of pizza. This year, I returned to the core of my initial studies to focus on pizza verace, the classic method. I visited all the pizzerias mentioned above again, along with Attilio Biachetti in Pignaseccha, Pizzeria Lombardi and the Salvo brothers at their respective locations; Francesco and Salvatore at Salvo, and Ciro at 50 Kalo. Although these pizzaiuoli may differ in how they make their impasto (dough), amount of yeast, water temperature, type of mixer, rise time, use of refrigeration or not, and gentleness of hands when extending the dough, they follow the standards set forth by the VPN. While I will continue to make dough by hand on occasion and experiment in other ways, on a daily basis I am using the methods I originally learned, coming full circle. With that said, I have introduced a few new pizze at Spacca. They are terrific with a light sparkling Gragnano. My first is a white pie I saw on the menu at Pepe in Grani. It uses bufala mozzarella and is topped with the aforementioned tomatoes. The concept is to use one cheese alone to highlight the nuances of each tomato. The second pie, also white, is Enzo Coccia’s creation. It pairs four particular cheeses, bufala, fior di latte, scamorza, and affumicato, with four particular tomatoes in quadrants on the pie and is a touch more complicated to make. I predict it will be difficult to choose a favorite. See you in 2015~buon anno!